A health maintenance organization, or HMO, only covers subscribers' medical expenses when they visit health providers that are part of the HMO's network. Preferred provider organizations, or PPOs, give their subscribers greater freedom to visit out-of-network doctors and hospitals but are more likely to consistently cover expenses when subscribers visit the PPO's preferred, in-network doctors and hospitals. PPO networks are often much larger than HMO networks, so it is more likely that a specialist provider a patient wants to see will be part of a PPO network. HMO plans are generally cheaper than PPO plans, but the gap has narrowed in recent years. Though more people choose PPO plans, HMO plans are rated more favorably by subscribers. Depends on HMO model. Network-based models are fairly flexible, while other HMO models can be quite restrictive. Fairly flexible, partially covers out-of-network care. Varies by plan. 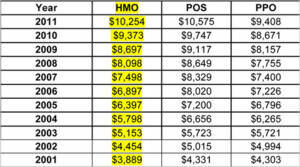 Most HMOs were cheaper than PPOs in the past but have sometimes been more expensive than PPOs in recent years. Likely to have no copay costs and low (or no) deductibles. Varies. Premiums higher than EPO's, may or may not be higher than HMO's. Costs more to visit out-of-network providers. Copays and deductibles often higher than HMO's. HMOs only cover subscribers' medical expenses when they visit in-network health providers. PPOs let subscribers visit out-of-network providers but cover more expenses when subscribers visit the preferred, in-network providers. Basic preventive care (e.g., checkups, physicals), emergencies, maternity care, surgeries, and treatment from specialists. Very unlikely to cover dental or visual care. May or may not cover abortion. Basic preventive care (e.g., checkups, physicals), emergencies, maternity care, surgeries, and treatment from specialists. Very unlikely to cover dental or visual care. May or may not cover abortion. Consumers are less likely to purchase an HMO plan than a PPO plan, but HMOs receive higher subscriber satisfaction ratings. Consumers are more likely to purchase a PPO plan than an HMO plan, but HMOs receive higher subscriber satisfaction ratings. In the U.S., health insurers tend to have networks of healthcare providers with whom they have special contracts. Insurers agree to encourage subscribers to see certain providers in return for a discount. The negotiated rates between insurers and healthcare providers are significantly lower than the list price that providers bill to uninsured patients. If a patient visits a doctor or hospital that her health plan has made a deal with, she is visiting a provider who is "in-network." If a patient visits a provider who is not recognized by her health plan, she is "out-of-network." In most all cases, visiting an in-network provider will be easier and cheaper than visiting one who is out of the network. Today, one of the biggest differences between HMOS and PPOs lies in how much patients are deterred from visiting out-of-network providers. With the exception of emergency care, which is typically covered following Affordable Care Act reform, HMOs only cover visits to in-network providers, facilities, and pharmacies. This means that an HMO subscriber who visits an out-of-network provider will have to pay for any and all care services out of pocket, as if he or she were completely uninsured. Usually HMOs manage care by assigning patients to a particular primary care physician who then further refers them to other specialists within the HMO, as needed. To learn more about how HMOs work, read about the different kinds of HMO models. PPOs are less restrictive than HMOs and will cover visits to both in-network and out-of-network providers. However, they prefer for subscribers to receive their care from within the network. Care received from out-of-network providers is likely to be covered less than care received from in-network healthcare providers; copays and coinsurance costs are likely to be higher. PPOs almost always offer more flexible insurance plans, but much depends on the individual plan. In the past, HMOs, especially those under the staff model, were highly restrictive and recognized few providers. Today's common HMO model, which is network-based, is much more flexible. When weighing up the pros and cons of an HMO versus a PPO, provider lists published by the insurer can help potential subscribers come to a decision. Restrictions imposed by various types of health insurance plans. Both HMOs and PPOs cover basic preventive care (e.g., checkups, physicals), emergencies, maternity care, surgeries, and treatment from specialists. In general, most physical health ailments will be covered. However, many insurance plans do not cover cosmetic surgeries, chiropractic services, long-term therapies and care, infertility treatments (e.g., IVF), weight loss surgeries (e.g., gastric bypass), or acupuncture. HMOs and PPOs may or may not cover abortion. Furthermore, many states ban insurance companies from covering the procedure. Though most HMOs and PPOs cover prescription drugs, they cover them at different coverage rates and in different ways. PPOs allow subscribers to fill their prescriptions at any pharmacy they want. HMOs, however, contract with pharmacies in the same way that they contract with healthcare workers and facilities. HMO subscribers must find a local pharmacy that is connected to their HMO plan to avoid paying the full price for their prescriptions. For HMO subscribers who live in rural areas that may lack an accessible, HMO-approved pharmacy, the HMO will typically reimburse them. Few HMO or PPO plans cover dental or visual care, though some will partially cover care for children. Some insurance companies may offer additional insurance coverage for dental checkups and visits to an optometrist, but this coverage will be an extra monthly premium. How long a patient has to wait to see a doctor varies significantly by region and specialty. Wait times are worse in cities. Once a patient enters a doctor's office, average wait times are usually between 15 and 25 minutes. For network-based insurance models, having a particular type of insurance should not affect wait times. Non-network-based HMO models may have longer wait times, though. In 2010, the state of California responded to patients' complaints by regulating HMOs' wait times. Since then, patients on an HMO plan in the state have been able to expect to see an HMO-approved doctor within 10 days and a specialist within 15. To date, California is the only state with such regulation. Today, HMO plans may cost more over the course of a year than PPO and POS plans. In the past, a major selling point of HMO plans was that they were much cheaper than PPO plans for businesses to buy for their employees and for individuals to purchase for themselves. Today, this is not always the case, and in recent years HMOs have actually cost more than PPOs. Still, much depends on an individual plan and the model under which it operates. When determining the cost of an insurance plan, it is worth closely checking copay costs, coinsurance percentages, and deductibles. Many HMOs do not require copays and have low deductibles. PPOs often cost more in exchange for their flexibility; their copay and coinsurance costs vary significantly but are rarely as low as those found in HMO plans. The cost of HMO and PPO plans bought through state or federal health exchanges that were rolled out as part of the Affordable Care Act will vary according to plan type: bronze, silver, gold, or platinum. Bronze plans cost less and cover less, while platinum plans cost much more and cover much more. Ultimately, which is better and more affordable for a subscriber depends on personal needs. A variety of companies provide HMO and PPO plans. Some are smaller companies that are only found in particular states, while others, like Blue Cross Blue Shield, have plans available in most states across the country. Those without health insurance benefits from an employer can use Healthcare.gov to view plans during open enrollment periods. To see how states' HMO and PPO plans rank in terms of customer satisfaction and quality of coverage, see the National Committee for Quality Assurance's 2013-2014 health plan rankings report. By far, consumers are more likely to purchase a PPO plan but be more satisfied with an HMO plan. In the NCQA's 2013-2014 health plan rankings report, 16 of the top 20 health plans operated under an HMO model. In general, smaller insurers and non-profit insurers (e.g., Kaiser Permanente) are rated more favorably than larger and for-profit insurers. One reason that satisfaction with HMOs is higher is likely that an integrated HMO — one where the insurance plan and the healthcare providers are offered by the same parent company — provides some healthcare services under one roof, a hospital it owns. This allows HMOs to coordinate care better between the patient's primary care physician and various specialists and diagnostic laboratories. It also helps that all of the patient's medical records are held by the same entity, so the HMO has better, more detailed medical history for the patient. Numerous kinds of HMO and PPO plans exist. Determining which is better really depends on the patient and his or her needs. Anyone switching to a new plan should make sure to read the fine print concerning coverage. Network model: This is the most common type of HMO today and the primary HMO type discussed throughout this comparison. It is like other network-based health insurance models, including PPOs, wherein patients are strongly encouraged to visit in-network providers to avoid paying more out of pocket. Staff model: A much more restrictive model, the HMO staff model not only contracts with certain doctors but has specific HMO doctors it personally employs as its staff for its own facilities. These HMO doctors only see the HMO's subscribers. This model was popular in the past but has fallen out of favor in more recent years. Group model: Unlike with the staff model, doctors and specialists are not hired directly by the HMO in this model, but a group of doctors and specialists is exclusively contracted with and paid in bulk; the doctors and specialists within the group decide how money received from the HMO is distributed. Similar to the staff model, the physicians within this group only see the HMO's subscribers. Open-panel model: This model is very similar to the group model, with the main difference being that the HMO contracts with an independent practice association where doctors are allowed to care for the HMO's subscribers and other patients who do not subscribe to the HMO's plans. In contrast to some other model's plans, this model will allow a primary care doctor to refer a patient to an out-of-network specialist for which the HMO will partially cover the expenses. Most PPO plans operate similarly to each other, with the main difference between them being how restrictive they are concerning primary care. Gatekeeper PPO: These PPO plans require subscribers to have a primary care physician, just like an HMO does. (However, the range of doctors to choose from under a gatekeeper PPO will almost certainly be wider than those found under an HMO.) This primary care doctor can then refer his or her patient to other doctors and specialists in the network or even outside of it. In other words, subscribers must first go through the "gatekeeper," the primary doctor, before receiving other care. Non-gatekeeper PPO: As the name implies, this model of PPO insurance requires no primary care physician. It is more flexible than the gatekeeper model and much more flexible than an HMO. This was a very useful comparison -- thanks!